Fun New Game to Play with Your Ball Loving Pup - Hide-and-Go-Fetch! 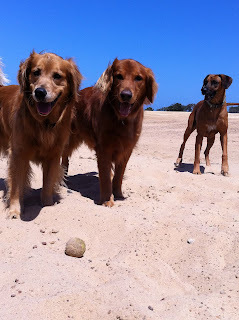 This game is inspired by my own goldens, Daisy and Taj who would choose a tennis ball over a treat any day! They are truly masters of fetch and will do anything and everything to have a gross, slobbery ball in their mouths. They are so good at playing fetch that they have created all sorts of games to play with a tennis ball. Their new favorite is dropping a ball down a hill into the street so that a human will fetch it because they know that they must never ever stop foot off the curb in front of our house. It's pretty funny to watch a human chase after a ball with the dog waiting for him to bring it back! They have also invented a game called Hide-and-Go-Fetch that will mentally wear them out instead of just tossing a ball over and over. Daisy and Taj love playing this even more than running for the ball because they get to use their mighty sniffers to hunt for the ball. It's amazing how fast their tails whip around in helicopter circles when they are on the prowl for their most prized possession. To play Hide-and-Go-Fetch your dog must know how to do a very reliable sit-stay so that you can disappear around a corner to go hide the ball somewhere. If your dog doesn't yet know how to sit-stay, begin by teaching him to sit and then slowly bring the ball to the ground. If your dog's bottom goes up, the ball goes up. It might look something like a seesaw when you first start. Your dog will quickly realize that if his bottom stays on the floor, the ball will be put down on the floor and you will release him to get it with a happy, "Ok!". Once your dog begins to understand the game, add in the verbal cue, "Stay," with a flat hand held up. Continue to work on this impulse control exercise until you can put the ball farther away from your dog by taking a few steps backwards. Don't move to quickly and make it too hard for your dog because he will break from a sit-stay if he is too excited. If he does break from it, be patient and put him right back into a sit where he started. Be sure not to give him to ball if he breaks it, otherwise you are rewarding him. The ball is the reward for sitting and staying until you go to him and release him to go find it. Once your dog is doing a sit-stay very reliably, start out by hiding the ball in an easy hiding spot behind a table leg for example. Then return to your dog and say, "Ok! Find it!". Your dog may need a little help from you pointing it out the first time, but the second time he will catch on and really start to use his nose. When your dog does find it, say, "Good! ", have a puppy party and play a little game of catch. Then you can have him sit-stay and then go hide it again. This time make it a little bit harder. Your dog's nose will love the scent work and you can play Hide-and-Go-Fetch inside and outside. It's a fun game to play inside on a rainy day because the stimulating mental activity will tire out a busy pup and mellow him out. Daisy and Taj are so good at playing the game inside that I have to hide it under blankets or behind tough to reach spots. Playing it outside in bushes and tall grass is a much more fun and and difficult challenge for them now. You can also use the same principles of the game to teach your dog to locate shoes or keys that have been lost around the house. Get creative and have fun with your dog! They'll love you for it!